CCS Technology Blog: Jr. Cougar Chromebooks! Excited for their new Chromebooks! Elementary classrooms are filled with fun! Students do many hands-on activities and learn a lot from their teachers and from each other. 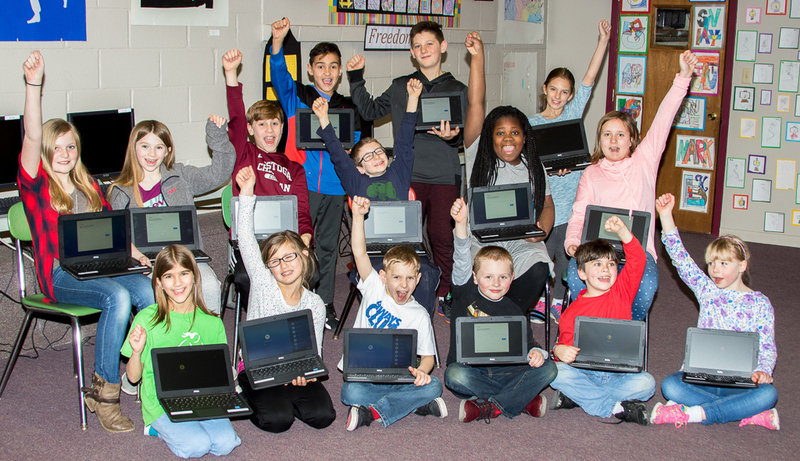 To support and enhance the learning that is already happening, we have deployed three Chromebooks to each elementary classroom in grades one through five. These small laptops were made possible through designated donations at last fall's annual auction. The Chromebooks can be used in addition to already available technology in the form of iPads and the six-station Chrome desktop "lab" located in the lower level of the elementary building. Students in grades three through five receive computer instruction once a week in a larger lab located in the high school building and are able to take what they have learned there and apply it when using the Chromebooks in their classrooms. We know that screen time can never take the place of person-to-person interactions between students and teachers, but we are pleased that the technology is available to supplement and reinforce the curriculum that teachers work so hard to implement.